Colorado Springs Motorcycle Accident Attorney | WM Andrew Wills II P.C. The thrill, joy and freedom that can come with riding a motorcycle can vanish the instant a motorcycle wreck happens. In the worst cases, these wrecks can result in irreversible losses, like permanent or fatal injuries. In the aftermath of a motorcycle wreck, you need the the support and representation of an experienced attorney. You need Colorado Springs Motorcycle Accident Lawyer Wm Andrew “Drew” Wills II. Attorney Drew Wills II is dedicated to helping injured riders pick up the pieces and seek the financial recoveries they deserve. Known for his integrity, professionalism and record of success, Drew is ready to explain your recovery options, provide you with exceptional advocacy and help you maximize your recovery. Failing to abide by traffic laws. Equipment malfunctions – Faulty or defective equipment on motorcycles (or other vehicles on the road) can also play a role in causing motorcycle wrecks. When tires, brakes, ignition systems or other equipment malfunctions, equipment manufacturers (and/or possibly repair shops or technicians) may be liable for the resulting accidents. Other parties – Other parties that may be liable for a motorcycle crash can vary widely. For instance, if a motorcycle crash is caused by a trucker, the trucking company may be liable (in addition to the trucker). If dangerous road conditions were a factor in a wreck, the city, county or other party responsible for maintaining safe roads can be liable. Attorney Drew Wills II can go over the details and evidence associated with your crash and point out all liable parties. Recovering from a Motorcycle Wreck: How Much Is a Motorcycle Accident Claim Worth? The liable parties and whether (or not) the rider may have been partially at fault – Here, it’s important to understand that, in Colorado, riders can be eligible for compensation even if they were partially responsible for causing a wreck. In fact, Colorado’s negligence law (modified comparative fault, 50 percent Bar Rule) allows at-fault injured riders to recover so long as they are 49 percent or less at fault for the crash. In these cases, the compensation is generally reduced in proportion to the fault finding. Whether punitive damages are available – Not applicable to all crash claims, punitive damages can be available when the negligence of the at-fault party is particularly abhorrent. As such, these damages are awarded when the court wants to specifically punish the at-fault party. Attorney Drew Wills II can help you protect your rights and the value of your claim every step of the way in order to maximize your recovery. While money can never offset the impacts of permanent or fatal injuries, compensation from these claims can be pivotal to survivors’ and families’ overall recovery. 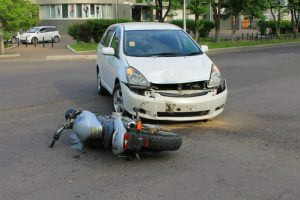 Start Recovering from Your Motorcycle Wreck: Contact a Colorado Springs Motorcycle Accident Lawyer at Wills Law, P.C. If you or a loved one has been hurt in a motorcycle crash, contact Colorado Springs Motorcycle Accident Lawyer Drew Wills II for essential legal advice regarding your potential claim. Call (719) 633-8500 or email the firm (via the form on our Contact Page) to schedule a consultation and get information about your legal options. In most cases, initial consultations are free. With more than 30 years of experience and success with motorcycle accident claims, Attorney Drew Wills II has the insight you can rely on to bring your claim to the best resolution possible.